“We are incredibly honoured to be selected by Canadian Retailers as 2016 Medium Supplier of the Year! The team at Grand International Trading have all worked extremely hard on delivering the best value for our retailers with unique product selection, competitive prices, speedy delivery and our genuine customer service. It's extraordinary to see that hard work pay off and we'll continue to convey the enormous gratitude we have for our customers through Grand's sales events and annual customer appreciation banquets. We are devoted to help Canadian retailers thrive! Here's to another memorable year in 2017!" Welcome to Grand---- one of Canada's leading fashion accessories and home décor suppliers! 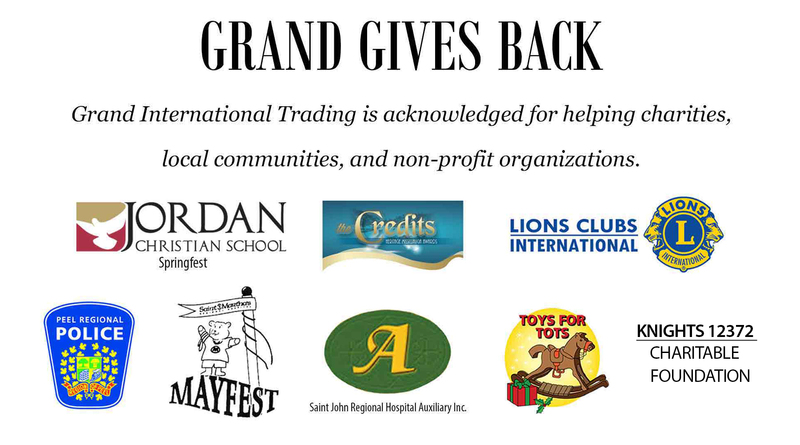 Grand International Trading is a Canadian importer and wholesaler established in 2001, widely appreciated by its great variety, nice selection, honest pricing, and customer loyalty. Grand proudly carries a wide range of fashion accessories including scarves, jewellery, handbags, apparel, eye-wear, and general giftware. 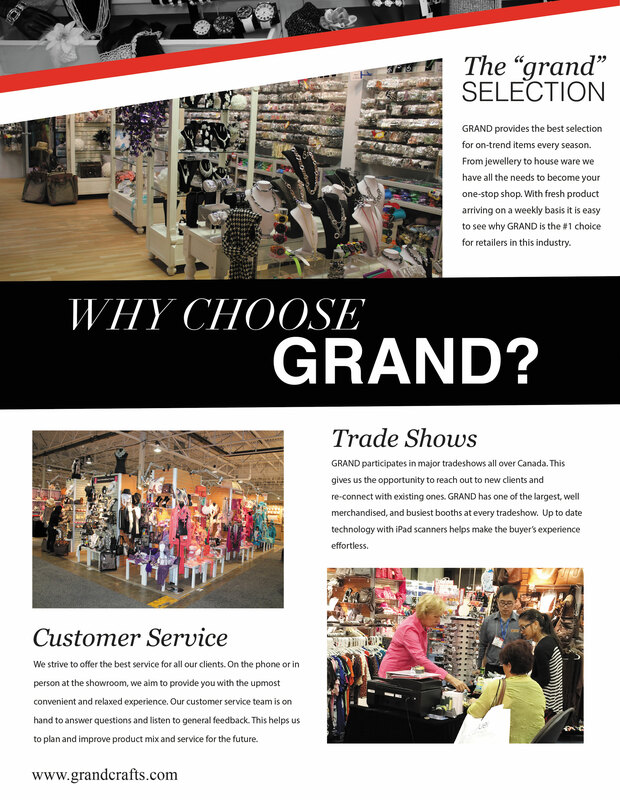 Grand understands the importance of having a wide range of on-trend, high-quality products for their customers at the right price. In order to keep up with the fast trends of fashion market, Grand's purchasing team always thrives to select the most trendy, stylish and high-quality products from vendors and manufactures around the world. 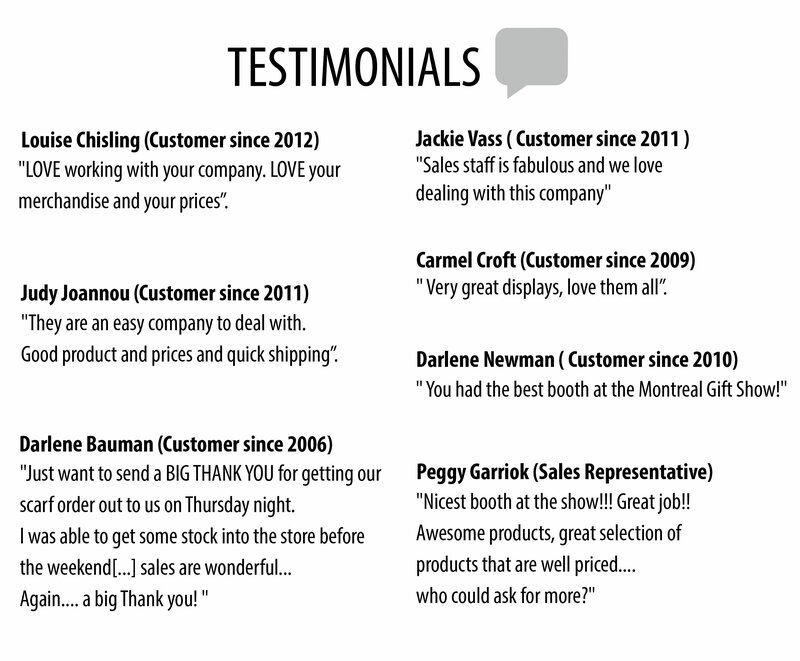 As a GOLD member of the Canadian Giftware and Tableware Association (CGTA), Grand attended six major trade-shows every year in Toronto, Edmonton and Montreal, which attracted hundreds of buyers to place orders. 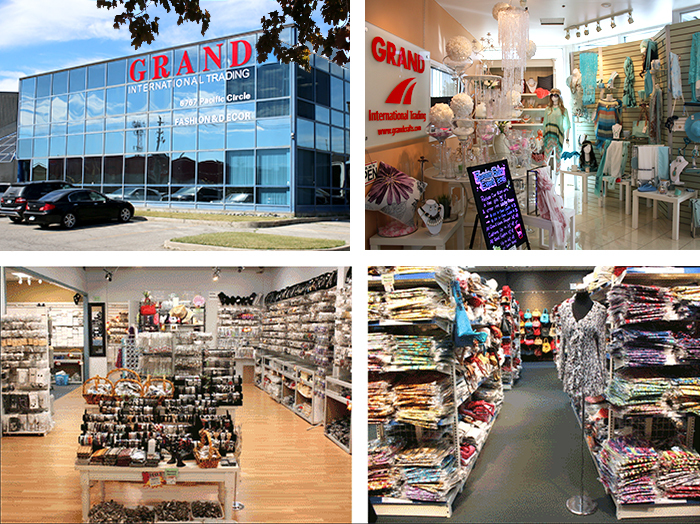 Located in Mississauga, Ontario, Grand has a 20,000 square-foot warehouse which includes a well-decorated showroom for walk-in customers to do Cash & Carry. Grand's sales channel includes 5 sales teams of more than 20 reps all over Canada. Being a supplier of some major fashion retailers, Grand has a strong customer base of over 1000 nationwide and rapidly growing. Through this website, Grand proudly presents you with our nicest collection of products. Our goal is to provide the best shopping experience for you!